Plus, how and when you should use it. Glossier’s first launch of 2018 is a welcome throwback to its “skin first” roots: Solution, a $24 liquid exfoliator that promises to fight acne and perfect skin, is already drawing comparisons to Biologique Recherche P50, minus the pungent smell the cult-favorite tonic is knowm for (Glossier’s is much milder, with a hint of acidic fruit). It also launches with a $4 pack of chemical-free, fragrance-free, lint-free, and Instagram-ready cotton rounds embroidered with the Glossier “G” monogram. With its signature millennial-pink packaging and 10 percent blend of exfoliating and acne-fighting acids, plus aloe (to sooth), glycerin (to hydrate), and niacinamide (to even out skin tone), Solution is perhaps the brand’s most ambitious skin-care product to date. To put an exclamation point on the launch, the brand preemptively collected accolades from top facialists like Nichola Joss and Gina Mari. What are the acids in Solution? 1. Salicylic Acid (a type of BHA): You know this tried-and-true ingredient from your favorite drugstore acne cleansers. BHAs are lipophilic, meaning they have an affinity to oils clogging your follicles. Clear pores mean fewer breakouts. 2. Glycolic and Lactic Acid (types of AHA): Glycolic acid is a popular and super effective exfoliant. AHAs are hydrophilic, meaning they have an affinity to water and can break the water bonds that attach dead skin cells to healthy skin. 3. Gluconolactone (a type of PHA): The gentlest acid in the bunch, PHAs moisturize and condition while exfoliating the skin. It’s a derm favorite partner to glycolic and also found in potent, office-only skin-care brands like Exuviance. Why should I use an exfoliating toner in the first place? In order for skin-care products to work effectively, the surface of your skin needs to be cleared of dirt, debris, and oil. The acids found in Solution can prep your face for your choice of serum, moisturizer, and, if you use it in the morning, sunscreen. Your makeup will also go on smoother, for a more flawless finish. If you’re already a fan of cult-classic Biologique Recherche P50 (like many a Coveteur alum), this will be a great alternative to try without breaking the bank. 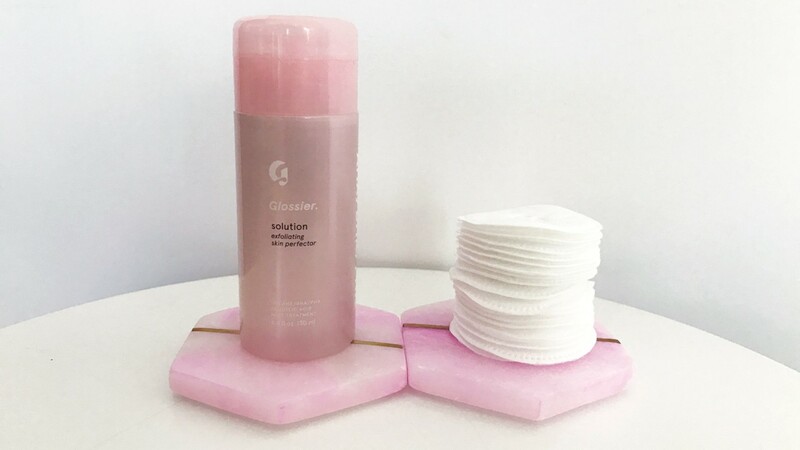 Glossier recommends once-daily use of Solution. With such a high concentration of acids, it’s best to do a patch test on your arm to see how your skin reacts first. Then, after cleansing, dry your skin, and use one to two pumps on a fresh cotton pad and sweep it over your face, avoiding the eye area. Don’t be surprised if you feel a slight tingle—that’s the acids working their magic! (If it turns from a tingle to a true burn, rinse right away.) We found that despite the tingling sensation post-application, there was no mad rush to lather up on moisturizer. The liquid consistency is extremely thin, and truth be told, a small amount escapes the top with each pump and winds up on your bathroom counter (tear). Overall, skin is left looking glowy and delightfully soft, albeit a bit tacky to the touch. Pro tip: Use an exfoliating toner at night when your skin is in deep recovery mode and cell regeneration is at its peak. The added exfoliation will allow your skin to more effectively repair and absorb your choice of nighttime ingredients (in the form of serums and moisturizers). Do You Actually Need to Use Toner?